KTM 1290 Super Duke R is more appropriately categorized as an adventure motorcycle. 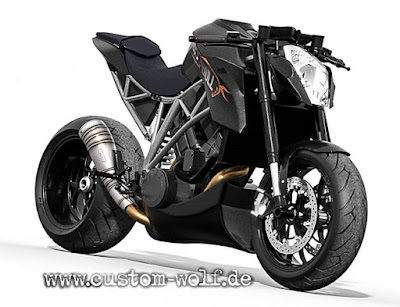 But in the hand of skillful modifier, the motorcycle was transformed into a radical street fighter bike. The builder who make the modifications of KTM 1290 Super Duke R is Custom Wolf. The result of this modification, dubbed 'Speed ​​Bull,' is a motorcycle may be the most extreme modification results this month. Renowned German tuner is working with KTM dealer Motoroox in Neumarkt, southern Germany. 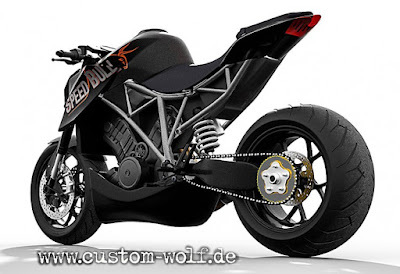 The cooperation in order to provide a unit of motorcycle, as well as removing some of the devices are still stuck on the KTM 1290 Super Duke R. The original fairing, windshield and handlebars removed, instead of motorcycles left bare and worn clamp handlebar. Then its frame was also left open but repainted in silver color. The other extreme there are at the rear wheels and tail. The rear suspension now uses a single swing arm to grip the tire now has a footprint size of 240 mm. The tail is also made slightly more looked up and tapering at the edges.